Jiangshi or Chinese Hopping Vampires are a unique kind of creature which originate from China. Although the story of the Jiangshi has been around for thousands of years, the idea that they drink blood is a more modern addition inspired by western vampires, as the original tales usually spoke of them draining the life force of their victim. The name 'Jiangshi' translates to "stiff corpse" as the original Jiangshi was more similar to a zombie than a vampire. The reason for the name "Chinese Hopping Vampire" is due to how they move. A Jiangshi is stiff with rigor mortis and has to hop to move as they can't move their legs. Sounds funny now but you still wouldn't want to see one late at night! Jiangshi may be the result of several misdeeds, including the use of necromancy to resurrect the dead; the spiritual possession of a corpse; a corpse who has absorbed enough qi to reanimate of its own volition; a corpse who has not received a proper burial after its funeral; a corpse who has been struck by lightning or jumped over by a pregnant cat; and a person whose soul fails to leave their body for various reasons, including an improper death, suicide, or the simple desire to want to ruin other people’s lives for no reason. 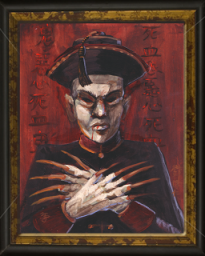 Stories of jiangshi began emerging around about the 15th century, during the Ming Dynasty, and were usually related to a practice known as “transporting the corpse over a thousand li” (千里行尸). It was, and still is, commonly believed that a person’s soul would become homesick if they were buried in an unfamiliar place, so it was paramount that the body be brought home for the funeral. Supposedly if someone died far away from home and their relatives could not afford a vehicle to carry their corpse back for burial, they could hire a Taoist priest to conduct a ritual that would reanimate the deceased and incite them to “hop” their way home. 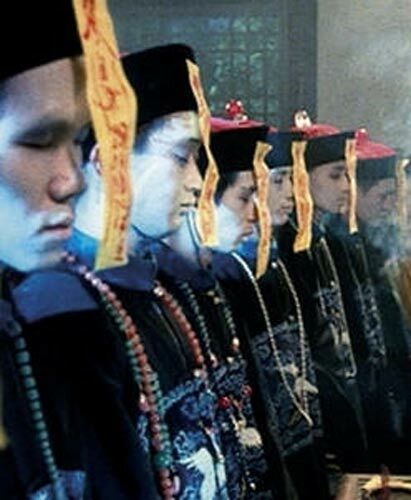 These priests would transport several corpses late at night and would ring bells to notify others of their approach, as it was considered bad luck for anyone to set eyes on a jiangshi. This practice was also called “driving corpses in Xiangxi” (湘西赶尸), as many people left their hometowns to work in Xiangxi Prefecture of Hunan Province. In actual fact, it is commonly thought that corpses would be arranged upright and tied to two long bamboo rods, which would be supported and carried by two men at either end. To the untrained eye, as the bamboo flexed up and down, the corpses would appear to be hopping.